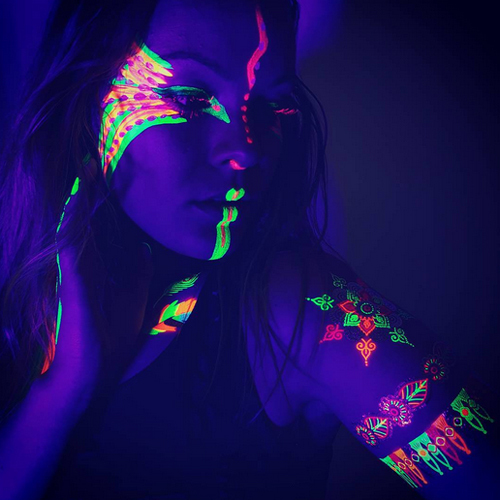 UV tattoos, also known as black light tattoos are created and made with a special invisible ink that remains almost unseen. Much more visible at a closer range of the tattoo. They omit a really cool neon glow under ultraviolet light, or a black light. Depending on the specifics of the ink itself, they can be more or less subtle in lighting environments that don’t have UV light. Although a good choice for someone with a more subtle tattoo idea in mind, they are a hot choice for your typical raver who indulges in that culture. The tattoos are technically invisible in normal lighting, giving off a slight outline depending on the ink used and what/where the tattoo is. The colors it can glow ranging anywhere from a bright white, purples, greens, and so forth. Special colored ink is also available for these occasions. They look like completely normal tattoos in your average lighting. However, in a black light tattoo they do just what regular UV tattoos do: Glow! Funny enough with tattoo ink, is that the FDA(Food and Drug Administration) does not and has not regulated tattoo ink(s) or the pigments in it used. Any claims made that have said UV tattoo ink is FDA Approved in any shop, or anytime being used is complete fraudulence. There’s been UV-reactive inks that can possibly have been approved by the FDA if the ink had some important food relation. Black light Tattoo ink is far more expensive and harder on your wallet then just the generic and typical ink used. There’s been some recorded cases of people having reactions to the ingredients in the ink itself, but nothing major. Small symptoms, such as: minor itching, irritation, and dermatitis. There are UV inks that are suspected of containing specific carcinogens and allergens. Unfortunately, there hasn’t been enough studying and research done on this to truly reveal the long lasting effects of exposure. There are some who have actual physical reactions to the ink when being tattooed, but is not really ink specific as normal ink can cause the user to have the same reactions. Oddly enough, this could be a result of using lotions, and any other sort of scented creams and the likes on the area that was tattooed. Not protecting it from UV light for the first 3 months has been speculated as a probable addition to the physical reactions.